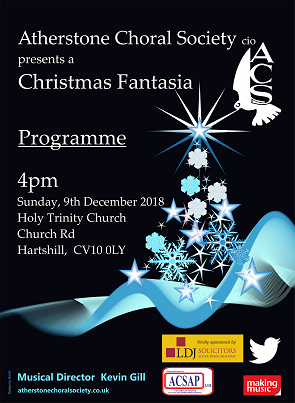 Our Annual Christmas Celebration this year takes place on the 9th December at 4.00pm, at Holy Trinity Church Hartshill, Nuneaton. This is a family concert with a selection of well known carols for everyone to sing as well as other Christmas choral and solo pieces. This year we are delighted to welcome back Andrew McWilliams (Bass/ Baritone soloist) who has sung with us many times before. Andrew will be performing Vaughan Williams, Fantasia on Christmas Carols which is for soloist, organ and choir. This concert is a lovely start to the Christmas Season and is always very popular with our regular audience so, make sure you put the date in your diary.